Pros: Works like they are intended to work. My testing on controller are done by my children. Microsoft makes very good thing, never great but always good. Cons: Microsoft, cost should be able to buy one for less that works as well..
Other Thoughts: Wait for a over stocked deal somewhere. Pros: I was looking for a second wireless 360 controller and saw this model on sale, I ordered one. The thumbsticks lack the usual four bumps that normal 360 controllers have, which was new to me. Bottom line is it makes no difference, although the grip on these thumbsticks seems to be of better quality than the regular 360 controllers. The D pad is cool, you can twist it which will cause the "cross" to stick out more or if you prefer the feel of the regular D pad you can change it back. Aside from the desert camo look, this is basically no different than any other 360 controller. Same functionally, same range, same reliability. Pros: Improved D-Pad feels great. Improved thumbstick grips feel great. Nice Camo design. Links up well with my PC receiver. Wireless connection is solid and stable on my PC, I haven't lost connection once. Cons: Had to return the first one because the right thumbstick drifted, which was noticeable in certain games. What happens is in an FPS game my character will keep turning all on it's own, even when I'm not touching the thumbstick. The replacement controller has the same problem although not quite as bad. My old 360 controllers don't do that for the right thumbstick, although the left thumbstick on one of my old controllers drifts. This is a quality control problem from Microsoft, as this drift has been a known issue for years on all their 360 controllers whether they are regular ones or special edition. Basically you have to get lucky to get one where neither thumbstick drifts. 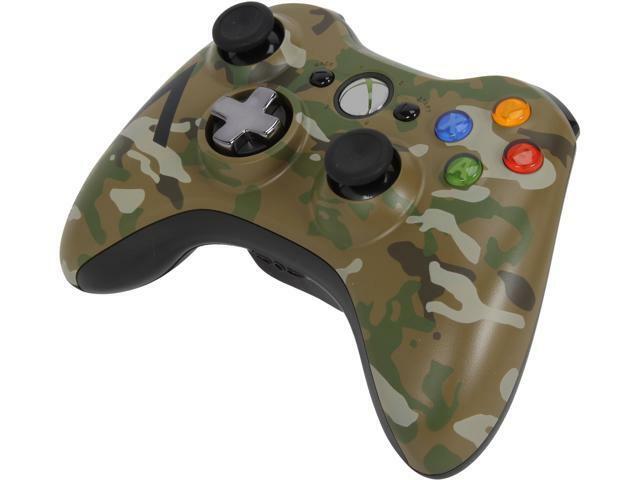 It cost me $7.50 to ship this camo controller back to Newegg, which is a significant chunk of money. Newegg was fast in sending the replacement. Other Thoughts: Not sure what to tell you. Xbox 360 controllers are the best and most comfortable controllers ever made, and the special edition gives some very nice improvements, but on any of the Xbox 360 controllers whether they are regular or special edition, you could have drift on one of the thumbsticks (or both) unless you get lucky. Again, it's only noticeable in certain games with tight dead zones. I've only used this controller on my PC so far. I took off 2 stars for the drift problem.